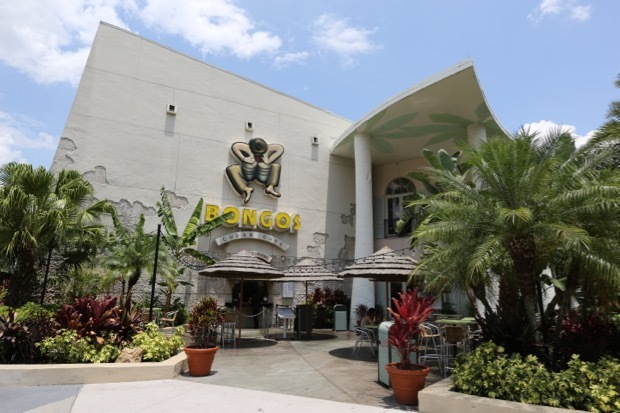 If you want to experience authentic Cuban cuisine, Bongos Cuban Cafe is the place to go. There's no mistaking its tropical roots when you see the two-story pineapple that adorns the exterior. Co-founded by Gloria and Emilio Estefan, Bongos evokes images of Havana of the 1940's and 50's. There's lush greenery, a fantastic mosaic mural, waterfall, and playful bongo drum barstools. There are two levels which offer indoor and outdoor seating. Each night, the official Desi Arnaz impersonator takes the stage and brings back the Havana that once was - and will be again. In addition to the two-story restaurant, there are three bars and an Express window. The Express window is open daily from 9:30am till midnight. Live band on Friday and Saturday nights from 9:00 to 2:00pm. There may be an entertainment venue scheduled which require separate cover at the door or pre-arrival ticket purchase. Menu discrepancies or corrections about Bongo's Cuban Cafe? Let us know!